It often seems like the moment a bad day begins there is no way out of it — we're just doomed to failure until it ends. But it does end, and trick to making that happen a little sooner involves one part "time travel" and one part humour. 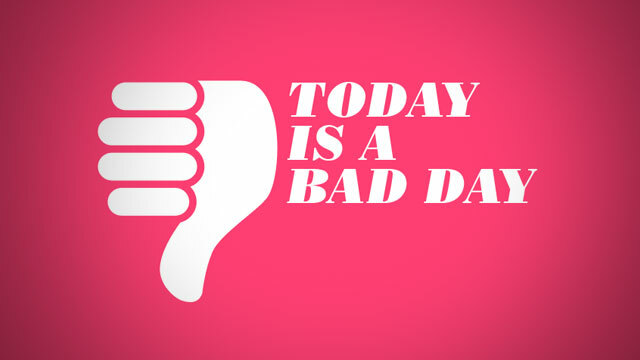 Here's how to beat a bad day before it starts. A bad day generally begins with a false start, or even a series of them. You might get up in the morning, get going a little later than you'd hoped, and then when you're rushing out the door you get to your car and realise you've forgotten something. You need it. You head back. You start driving, rushed, and then realise you're out of petrol. You exit the highway but you don't know where the nearest petrol station is. You search big streets and finally find a petrol station. You end up overpaying. You're definitely going to be late today. The gas pump doesn't accept your debit card because it's a piece of crap. You have no cash. You have to use the ATM. The ATM is one of those slow ATMs that still uses a dial-up mode. Wait, dial-up, seriously? I DON'T HAVE TIME FOR THIS CRAP!! This is an example of how a bad day begins, but it's really not a bad day at all. What happened here is that 1) you made a couple of small mistakes that happened to affect you at the same time, and 2) you've started considering normal behaviour and events to be bad luck directed at you. You're not that special. You're just being self-absorbed. We create bad days by thinking too much about what's happening to us and not enough about what's actually happening. We give significance to minutia rather than look at that minutia for what it is. Realising this is the first step in beating a bad day. When something bad happens — whether you've caused the pain yourself or your were just the unlucky victim of poor timing — the first thing you need to do is quickly deconstruct the moment, then look at the bigger picture. If a bird needs to evacuate its bowels and you're unlucky enough to cross paths with the jettisoned poop, there's really nothing you can do about that. A bird just crapped on you. In a week, you probably won't even remember it happened. If you forgot to fill up your car with gas, that's all you did. You'll lose ten minutes of your morning. The world will remain unchanged. These things all seem very obvious right now but they're not when you're angry and emotional. The key to beating a bad day is to quickly convince yourself that what just happened is not a big deal and there's nothing you can do about it. Of course, that's a little easier said than done. While you know right now that a little bird crap isn't going to kill you — well, in most cases — you are going to have a hard time believing that while you wipe poop off your face and out of your hair. Fortunately, the way to get around this problem is to do a little time travelling and look to the future. Most of the time, you're going to laugh about this with friends later. Your friends are going to make fun of you for getting pooped on, and you'll find it funny too. You need to be a friend to yourself at this moment and start to find it funny. Pretend it happened to someone else if that helps. If you start thinking about the situation abstractly, and then remember it happened to you, you'll have a much lighter attitude about the entire thing. The same goes for the gas situation. If you tell your friends about all the mistakes you made that day, and how late it made you that morning, they're going to laugh at you for being dumb. You got lost finding a petrol station less than half a mile from your house. That's something only someone with your horrible sense of direction would do. Your horrible sense of direction is something you and your friends probably make fun of on a regular basis. It's not that you're having a bad day, it's just that the part of you that's a total idiot decided to make an appearance. That part of you can have a cameo or a starring role. It's your choice. Make fun of yourself and laugh about it now, or let these bad events compound and affect you more and more dramatically as the day goes on.